Truly a Rock Concert phenomena. 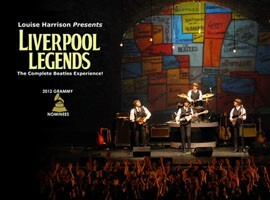 The Liverpool Legends reenacts The Beatles to a tee! I’m not kidding. Ok – I never actually got to see The Beatles. But I clearly understand the hysteria. My girls experienced the same thing when they went to a One Direction concert with their dad. And they thought it was unique to those boys. Uh. NO. The Beatles unleashed the hysteria in teenagers across the nation decades ago. So my girls joined me to see what on earth I was talking about. And sure enough, the film playing before the Liverpool Legends showtime has it right there in black and white! Crazy. Hysterical. Beatlemania. And then the band starts playing and 40 minutes into the live show the whole theater is dancing and singing along and the girls got it. 1D isn’t the first boy band to ever elicit this much LOVE!